Jill Harrington Nichols’ paintings range from quick observational studies to large involved compositions. Her paintings play with time, space and mathematics. Her mastery of color and distinctive brush strokes create a directness and freshness in her paintings. Jill developed her sense of color and composition over many years while working in the commercial arts. She earned her BS degree in Journalism at the University of Colorado. In 2000, Jill began to focus on her painting. 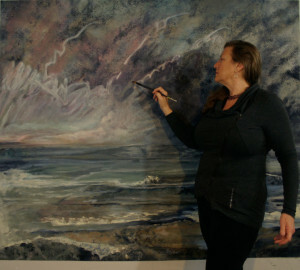 She trained at the Art Students League, NYC and earned her MFA in painting at Western Connecticut State University. Her paintings are in notable international collections; including the former FBI Director, James Comey and the Yale Medical Center. The Vatican Observatory Museum will be taking delivery of a full scale print of Jill’s painting, ‘Phi’ in July 2019. In addition to painting, Jill enjoys teaching art at the University of New Haven, in private & group lessons, and workshops. My painting is poetry, a lyrical composition of color and light instilled with a profound reverence of nature’s beauty. My work reveals the transience of life while transcending time and space. When I am painting I am in the moment, thoroughly present and enraptured. I experience a sense of peace, as well as an urgency to capture and share the moment. It is a privilege to paint. Please visit her Facebook Fine Art page for updates. Please leave a comment below or contact her via email. Hi Jill, There was a gorgeous painting of two little girls on a beach at the Fairfield Women’s Exchange not too long ago. I loved it and would love something similar of my two children. I wrote down your name at the time I was there and googling now, hopefully this is you! Please let me know and if you would be able to do a painting from a picture? I look forward to hearing from you.